This past summer I worked intently on a series of paintings for a show coming up in February, 2014 at the Contreras Gallery in Tucson. The show opens on February first, which is coming up very fast. I am glad I have already done the bulk of the paintings. 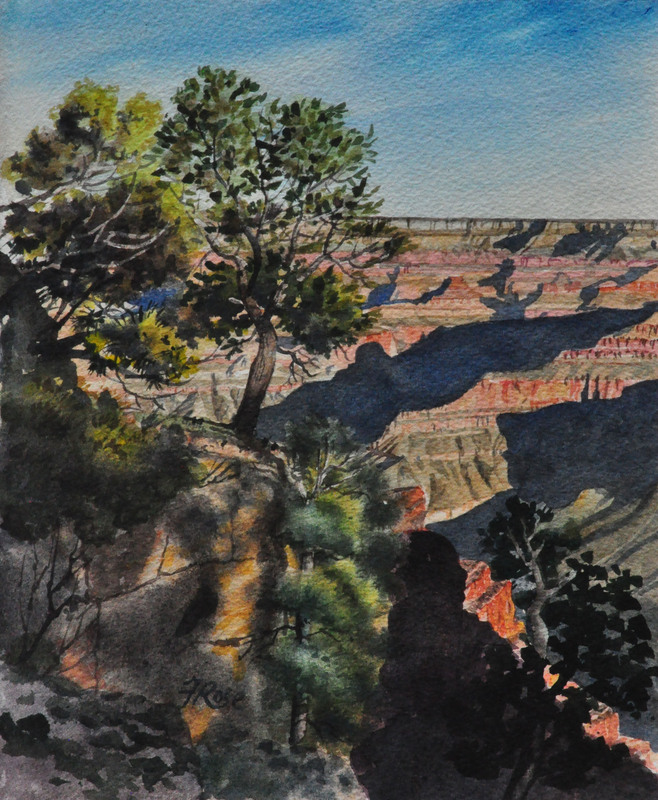 It has been a special treat to return to trying to capture this inspiring landscape. It is also a challenge is to take a fresh look at this very familiar natural wonder. When I got up last Wednesday morning it was still dark. Looking to the west I could see the nearly full moon getting ready to set, with Saturn shining brightly a few degrees above it. 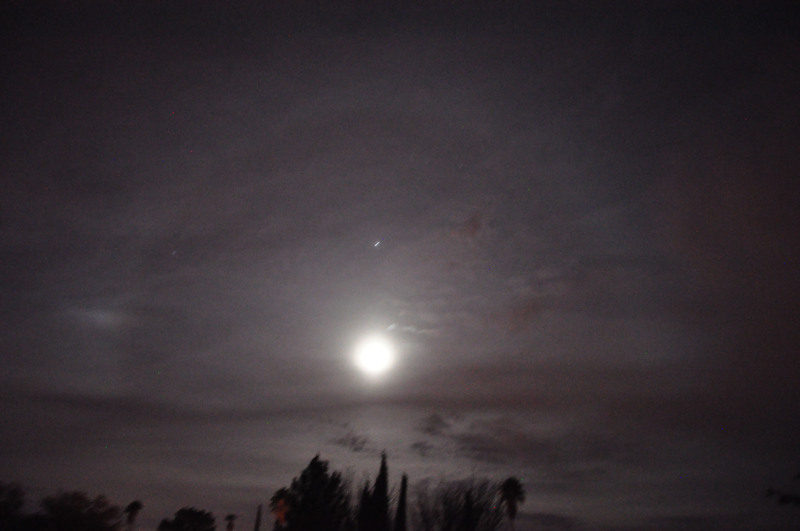 There was a very faint but still visible halo around the moon. Perhaps you can see it in this photograph. You can also see that the camera moved during the exposure, so Saturn is a short white line instead of being a dot. This phenomenon tells of ice crystals high in the sky and indicates that rain is coming. When I rose this morning (Saturday), it was raining and there was a third of an inch in the rain gauge. 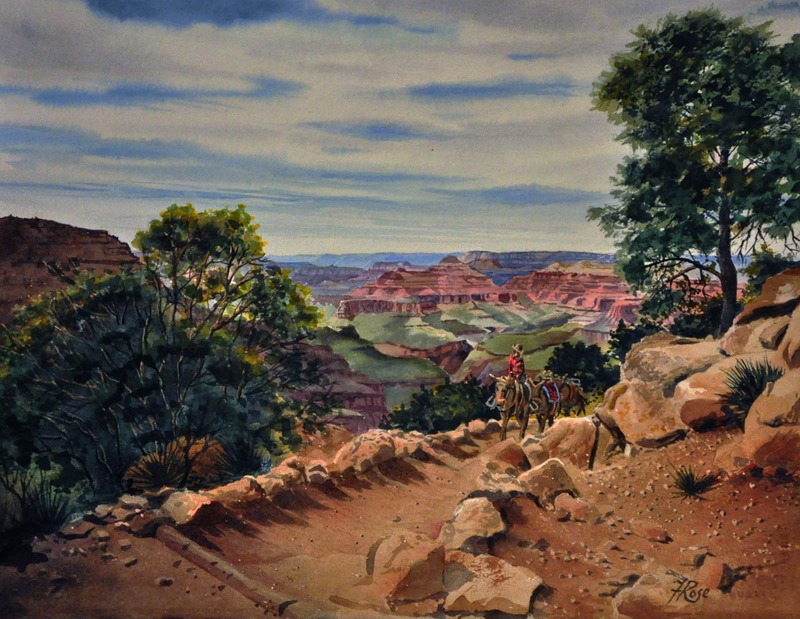 It has been mild lately, with temperatures into the high seventies, so Ed and I decided to drive higher into the mountain range. At the ski area the sun was just a glowing spot in an overcast day. 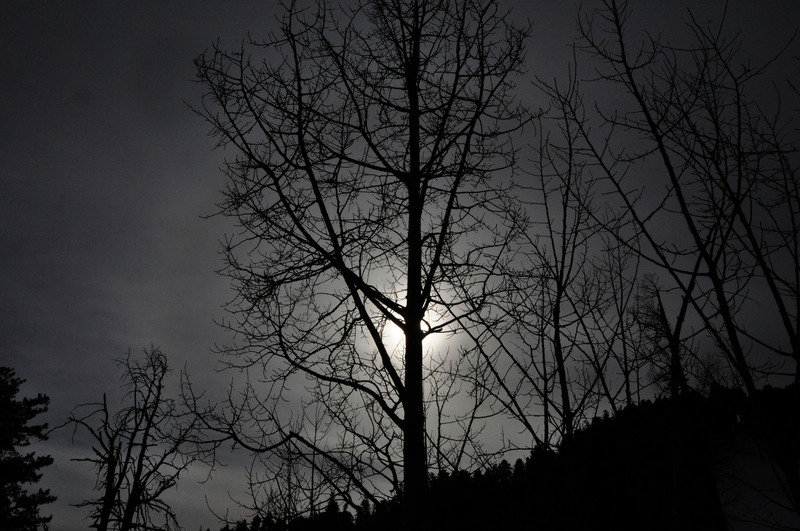 The picture below shows the sky through the tracery of Quaking aspen with a hint of a halo around the sun like the one I had seen around the moon early the same morning. .
We hiked up Turkey run, very comfortable in our light jackets. 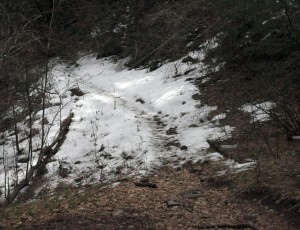 We did not see any flowers in bloom, but had the pleasure of enjoying the fresh air and the patches of snow. 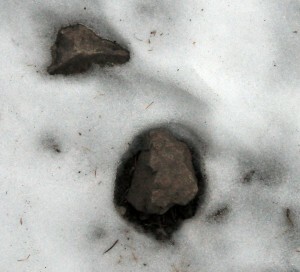 We noticed that small rocks along the trail had created pockets for themselves. Even the needles of pine trees melted little depressions on the surface, since the rocks and needles absorb the heat from the sun better than the snow does. The slow drip of water in the grotto area that we love to visit had turned into a frozen waterfall. The trail was clear under the forest canopy. In places where the sky was open above, there were patches of snow, as in this picture. We did not see any flowers in bloom this late in December, and did not expect to see them. At the Mount Lemmon General Store, where we stopped for a snack, we saw a Common mallow plant (Malva neglecta) in full and glorious bloom. 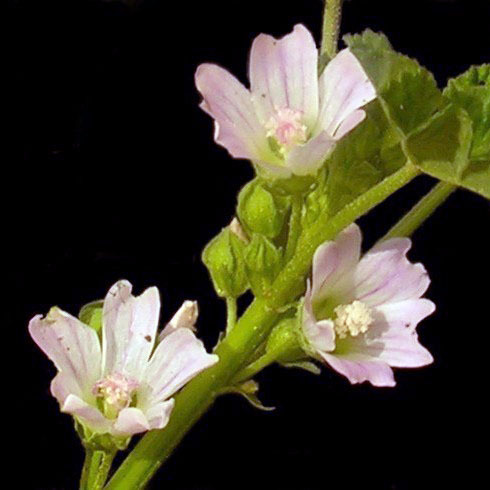 This photograph of Common Mallow was taken at an earlier time. 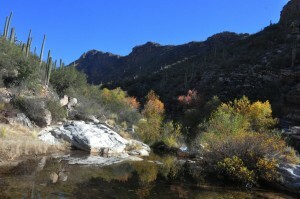 Dave and I hiked in Ventana Canyon yesterday – so named because “Ventana” is Spanish for window. 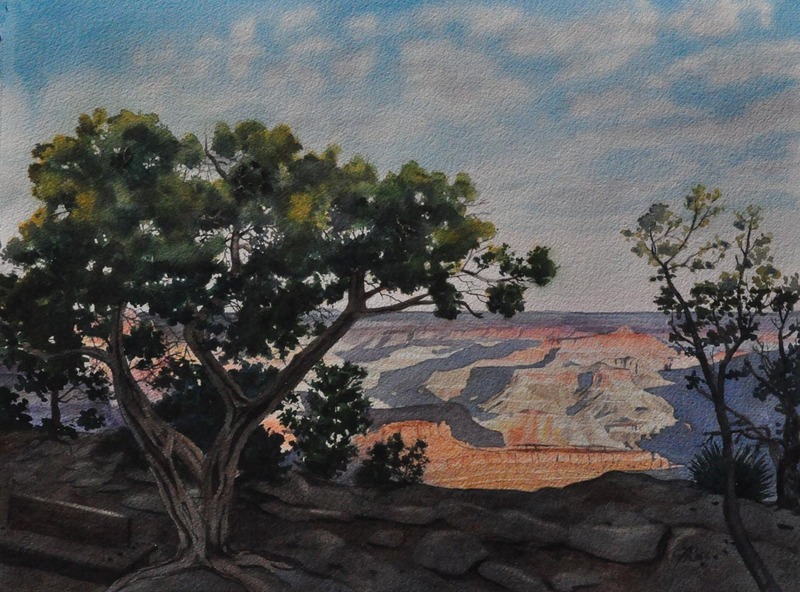 High up the trail you come to a window – about 15 feet high and 25 feet wide. This map shows the trail we followed. 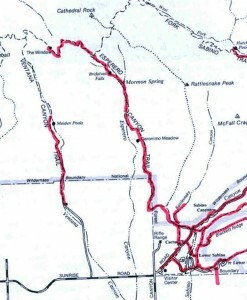 The trails we have hiked are marked in red. After the wedding we headed back the way we had come, going as fast as we could so as to not have to hike too long in the heat of the next day. At a certain point it was simply too dark, so we lay down on the trail where we were, and fitfully slept until the early light of morning woke us. We hurried down into the 109 degree heat of a Tucson summer day. It took quite a while for us to cool down I had to immerse myself in a tub of cold water. The following day we felt fine. Whenever I hike in Ventana Canyon, I think of that adventure. Yesterday started cool, but got warmer, even though it is mid December. 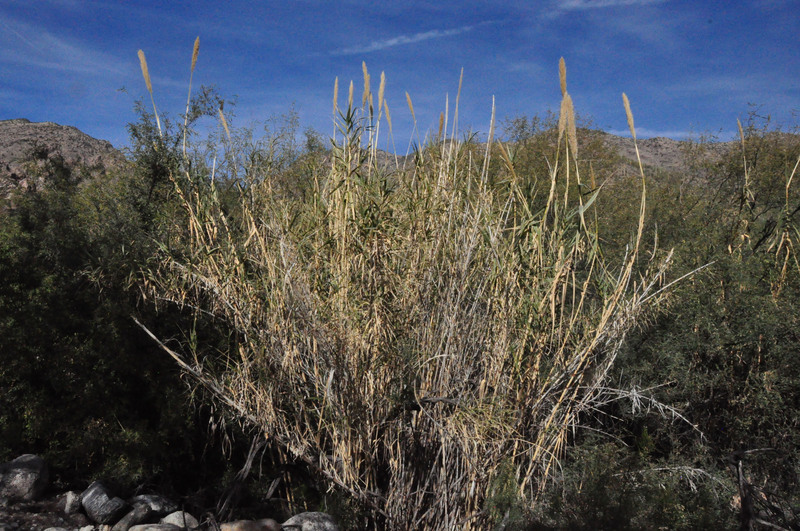 The first thing we noticed was the very tall grass called Giant Reed (Arundo donax). 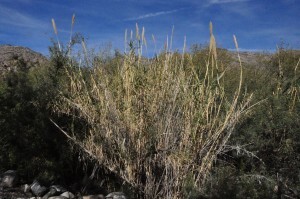 Some time ago I went to a talk in Sabino Canyon where they spoke of the task of eradicating this very aggressive plant from the Canyon. It had taken over large areas, and was crowding out the native species of trees and plants. Dave and I went off the trail to get a closer look at this member of the grass family. The plant in this picture is 15 feet tall at least. Farther along the trail we saw other clumps of the grass, and commented on how difficult it would be to keep it from taking over Ventana Canyon. 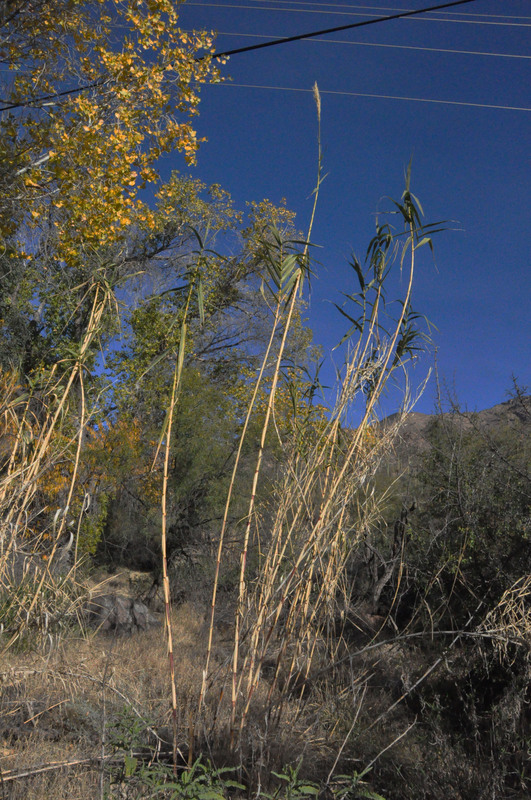 The plant on the left is at least 15 feet tall. After exploring the trail and the stream bed, we came to a nice resting place. 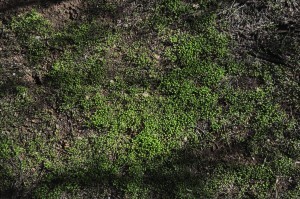 There were thousands of seedlings carpeting the ground. I particularly noticed this one. 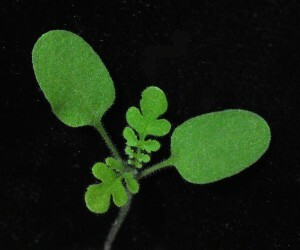 Dicot plants send up a shoot which branches into two leaves (from Dicotyledon, meaning two Cotyledons, or seed leaves). These leaves look much the same in a variety of plants. Then the plant produces new leaves recognizable as belonging to a certain species. 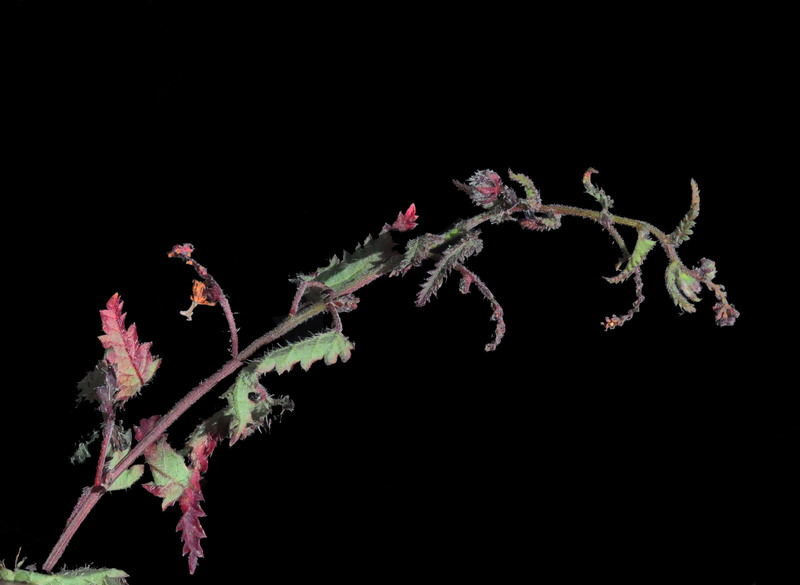 In this case we can see from the crinkled leaves, that it is a Phacelia (Heliotrope or Scorpion weed). In a few months the floor of the canyon will be graced with a light purple haze from the beautiful flowers of this plant, mixed in with the blues, golds and whites of thousands of other wildflowers. Ed’s brother, Bob was visiting, so last Wednesday the three of us hiked up Bear Canyon toward Seven Falls. It was a little cool at first, but after a short time we were peeling off layers of clothes and basking in the warmth of the sun. 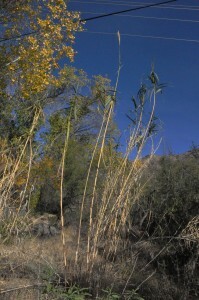 The canyon was bright with the gold color of autumn leaves, including Velvet Ash, Fremont Cottonwood and Bonpland willow. Added to this was the rich orange-brown color of the Arizona Sycamore. 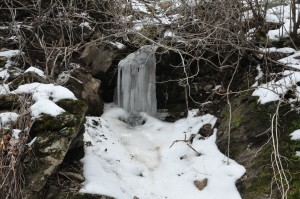 There was plenty of water in the creek from snow melt higher up the mountain. 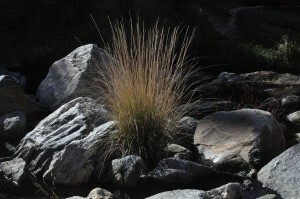 I was particularly conscious of the grasses, noting with some regret, how many of them were not native to this area. 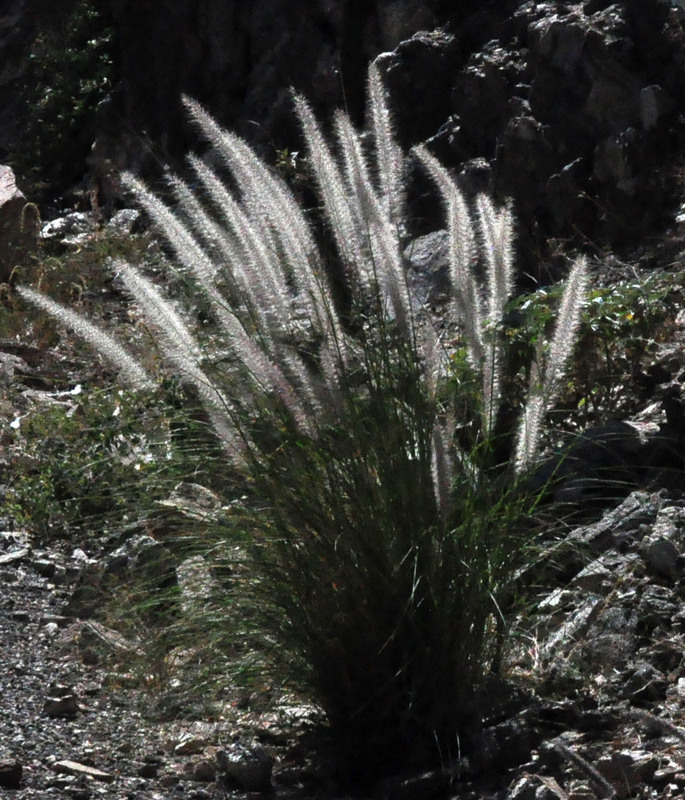 We saw lots of the admittedly beautiful but yet threatening Fountain grass, (which was deliberately introduced into Southern Arizona in the 1940’s). Its near relative, Buffel grass (Pennisetum ciliare), is even more of a problem. Both were in bloom. I couldn’t help noticing the similarities and differences between the foliage of the Fountain grass (Pennisetum setaceum) and the local Deer grass (Muhlenbergia rigens). There have been some heavy rains recently leading to fresh growth. 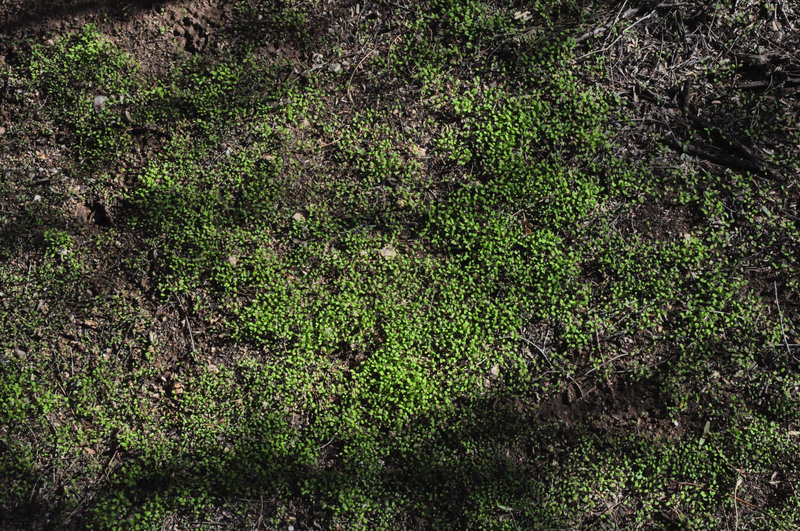 Places along the trail were totally covered with little green seedlings. If we get some more rain early in the New Year, we should have a spectacular display of Spring flowers in just a few months. 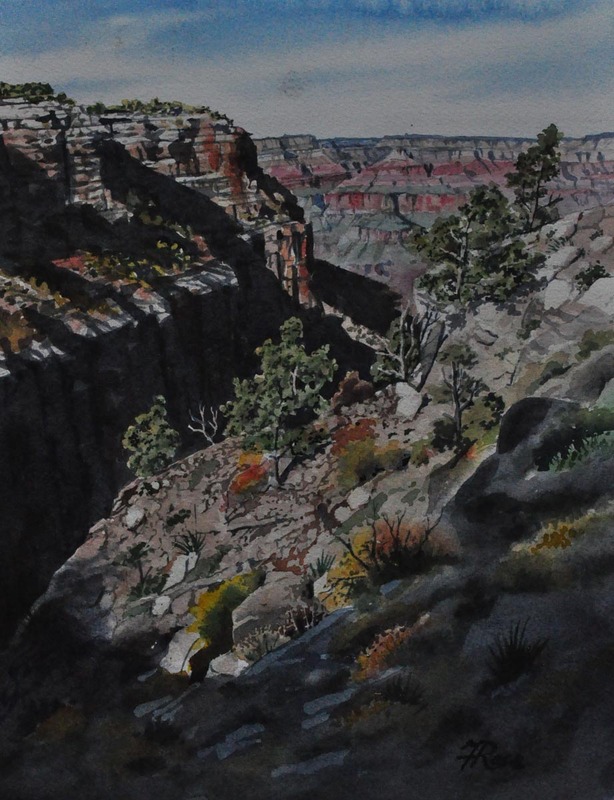 I have been continuing to create watercolor paintings of Grand Canyon for a show at the Contreras Gallery in Tucson opening on February 6, 2014. This is the most recent one, done from a photograph taken early in the morning. 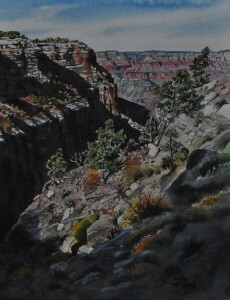 I enjoyed the diagonal slope of the foreground cliff and opposing diagonals of the canyon shadows. I also appreciated the way the trees and other plants hang out over the canyon, so I called it “Life at the Edge.” The image size is 10″x8″. I started working on another painting, and when I had done the drawing realized it was taken from a spot only a few feet away from this painting. This shows how much I liked the view! The final effect will look very different. The forecast yesterday included high winds and a chance of rain. 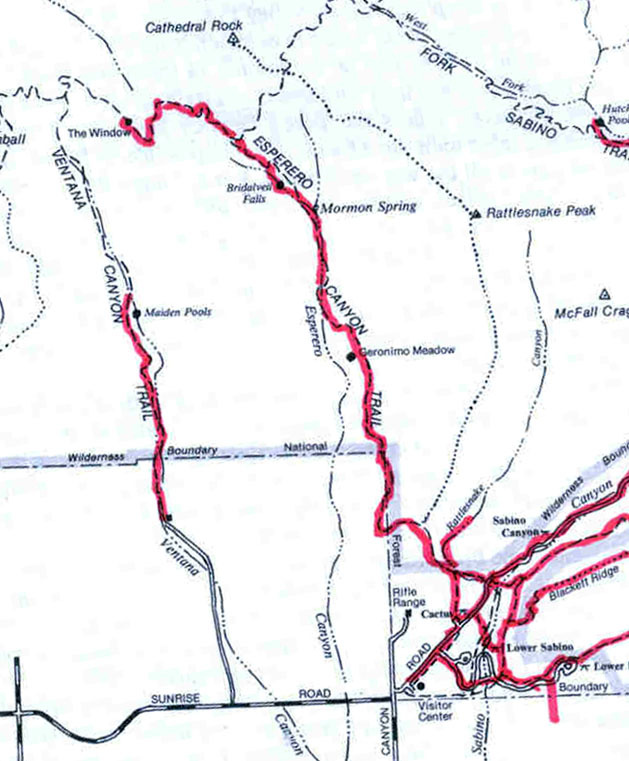 Ed and I set off for Saguaro National Park East and the Cactus Forest Trail. We walked past the old lime kilns, came to a junction in the trail and decided to head for Lime Falls. The trail in part follows a stream bed. There were even a few little pools of water left over from rain last week. As we walked I told Ed about my new interest in Spurges – members of the Euphorbia family. It is a very large family with 300 genera and about 7,500 species. 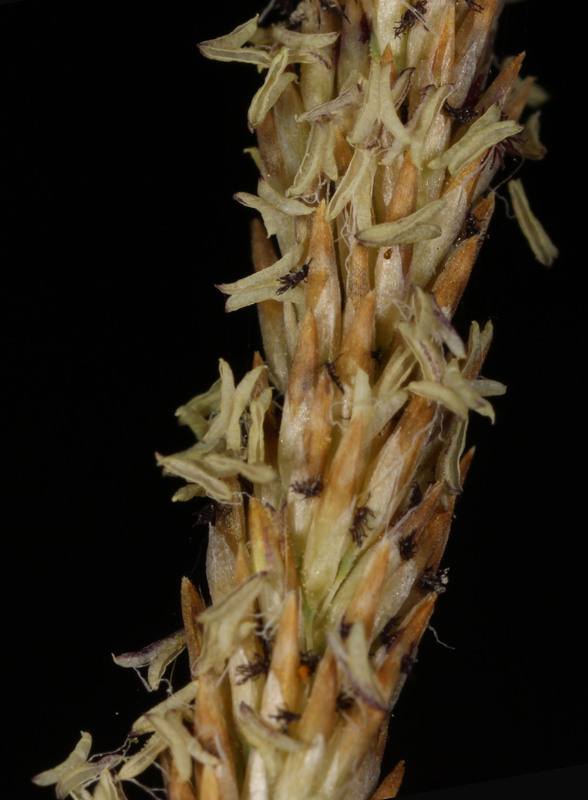 Many of them have “invisible” flowers as I have noted in this blog before. Probably the most famous, especially this time of year, is Poinsettia (Euphorbia pulcherrima). 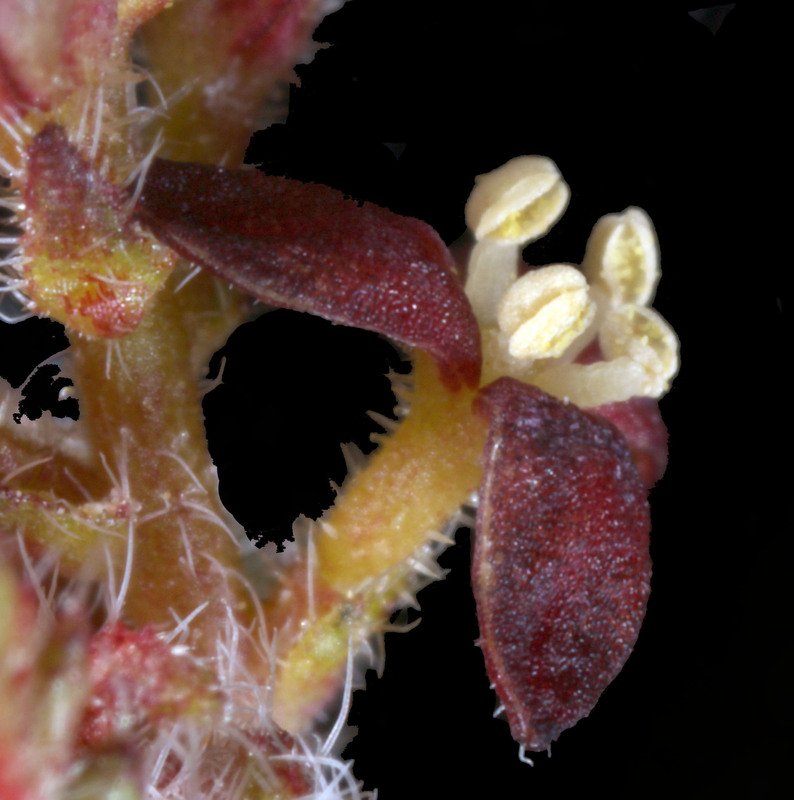 Poinsettia flowers are very small, hidden in the center of the top leaves. 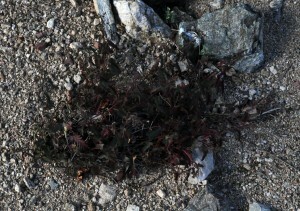 The leaves are the showy part and may be red or a variety of other colors. I told Ed that I had even thought of buying a book about this family, but learned that the one that seemed the most interesting costs about $500 (in a ten-volume set). It is definitely a fascinating family, but maybe not worth that much to me right now. Just then I looked down in the stream bed and saw a rather dark plant. Some of its leave had turned red. I knew at once it was Nose burn (Tragia nepetifolia), so called because its leaves irritate the skin. Until today I had never dared to pick the plant or inspect the flowers at close range. It seemed to both of us that it was not in bloom. 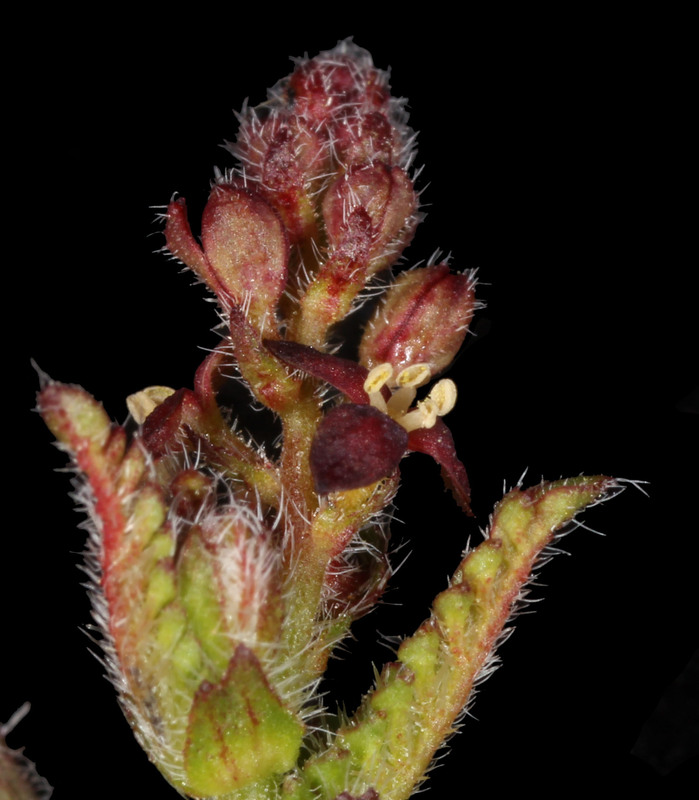 A few days ago I had looked for flowers on this plant in Molino Basin and concluded that it was long past blooming, so I assumed that this one was no longer in flower. But then, realizing that we were dealing with an “invisible” flower, I leaned down, and inspected it with my loupe. To my delight it was in full and glorious bloom. I picked a sprig, not worrying at all about its stinging reputation. It was not very irritating after all. Here are the pictures I took of this fascinating plant. Looking straight down at Nose burn in the stream bed. One would not expect to find flowers on this plant, which was about a foot wide. This branch is a little the worse for wear. Note how some leaves have turned red. The flowering part is at the top of the branch. This is a close-up of the flowering head. And a close-up of the close-up. We met a couple on the trail, and after a brief conversation realized that we had met them before much higher up on the mountain – an area called Bear Wallow. 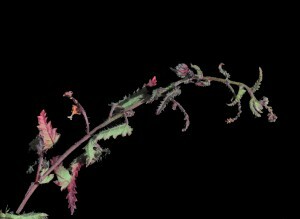 They were Rick and Pat, and were very much interested in all aspects of nature, so we introduced them to this “invisible” flower and invited them to join the blog so that they could see these pictures. It was a very pleasant day in the desert. We even saw other plants in bloom, including a Brittle bush, Wire lettuce, Dalea (pulchra, we think), and now this Nose burn. When I woke up this morning there were three tenths of an inch in the rain gauge, so the rain did come, and very welcome it is.